We like to think of it as a Convenient Store! If you haven’t stopped by our marina store, you’re in for a treat! Over the years we’ve been privileged to be a part of many family traditions that involve dropping in Anchorage for a coke and candy or something from our ice cream freezer. We’ve always carried a few grocery necessities because we know how easy it is to forget to snag something in town. And sometimes you just need chips and dip for those slow summer afternoons. Whatever the case may be, we’re here to serve so call us up or stop by to see if we can help! 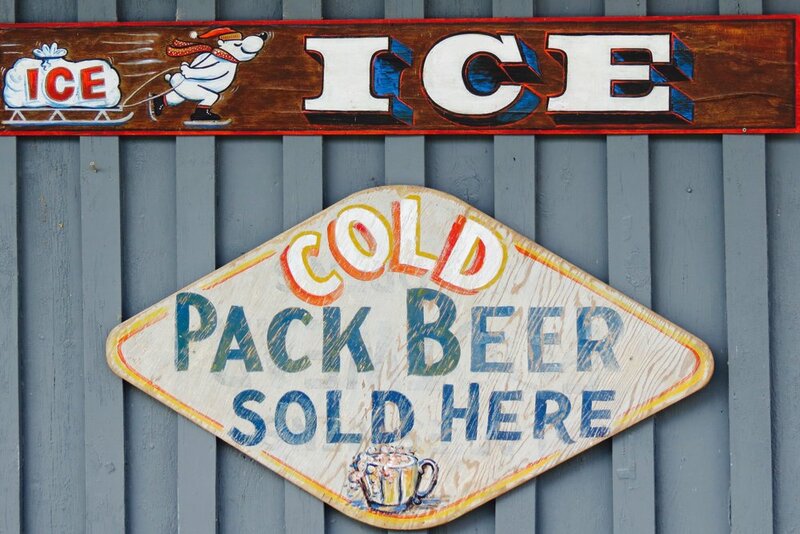 Refreshing Drinks, frozen treats & more! Available every day except Sunday! We carry a surprising variety of interesting products related to Lake Burton, lake life, our history and the things we care about the most. 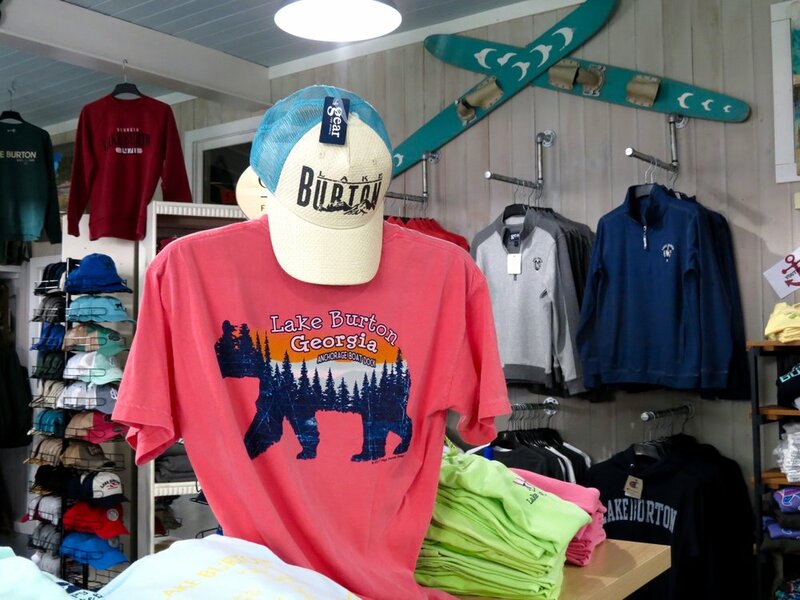 Besides the clever gifts and endless novelty items, the retail section of our marina store has exclusive Lake Burton gear for men and women of all ages. We’ve got a great line of jackets, sweatshirts, t-shirts, stylish swim trunks, hats and so much more. Every winter we are constantly asked about the new items we have coming in and what we’re planning on ordering for the following summer. Stop in and become a part of the tradition! Because who doesn’t like summer reading? At ports around the world years and years ago, sailers would exchange books at the local lending library so as to pass along the ones they had enjoyed and discover new ones. We’re just following in that spirit by providing a bank of sure-to-delight summer reading materials! Stop by and peruse our collection to see if something catches your eye. It’s the neighborly thing to do! When a piece of bread won’t cut it! Boating equipment and water sports gear. We’ve found that what’s in your boat can be much more important that what sort of boat you’re in. We’ve got you covered, whether you need a fire extinguisher or a new tube to pull the kids (or the grown up kids!) behind the boat. Safety equipment, life jackets, cup holders, ski ropes, and lots more. We sell wakeboards and kneeboards and can probably point you in the right direction for lessons if you’re so inclined! Stop by or give us a call if there’s something specific you’re looking for. and some stuff you might just want! Part of the historic original Anchorage Boat Dock, our Live Bait is kept in the original cool compartments fed by natural spring water. You can rest assured, whether you’re looking for minnows or earthworms, we can provide you with live bait preserved in its natural environment. Drop by and lift the lids on one of our tanks to see the minnows. We’re proud to continue the strong, record-setting tradition of fishing excellence set by the late Charlie Poole and proudly display his most impressive trophies around the store. So good luck and don’t blame us if you don’t catch anything! Other things that might interest you!